This is our full cooking guide to Monster Hunter World, including how you can cook and eat at the Canteen area. Cooking is a surprisingly big part of Monster Hunter World, especially if you’re going to go up against some of the more powerful monsters in the game. 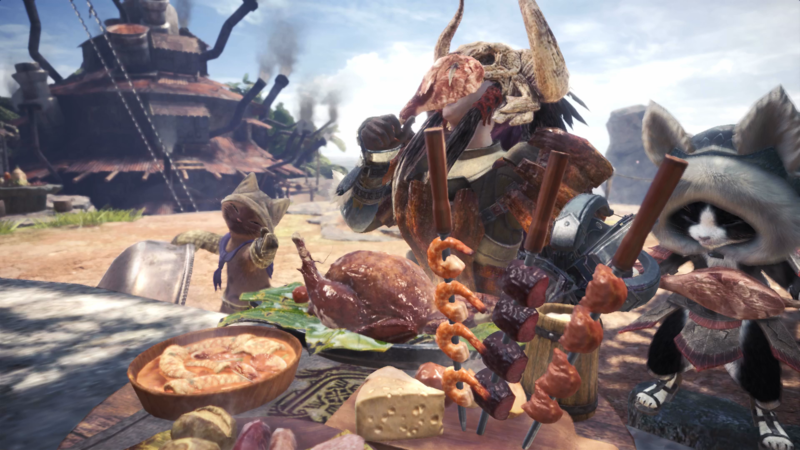 In this Monster Hunter World cooking guide, we’ll be walking you through the basics of how to cook your meat to perfection, as well as how to take advantage of the Monster Hunter World Canteen in the main hub area. On top of this, we'll also be running over the best MHW meals that you can order from the Canteen. 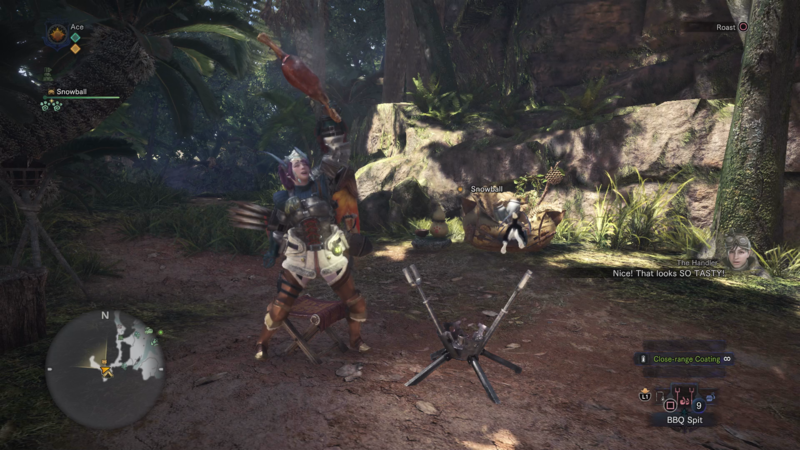 Should you instead need anything else on the huge game of MHW, including how to track monsters quickly using the Scout Flies, as well as how to play online and offline, make sure to check out our Monster Hunter World guides walkthrough hub. 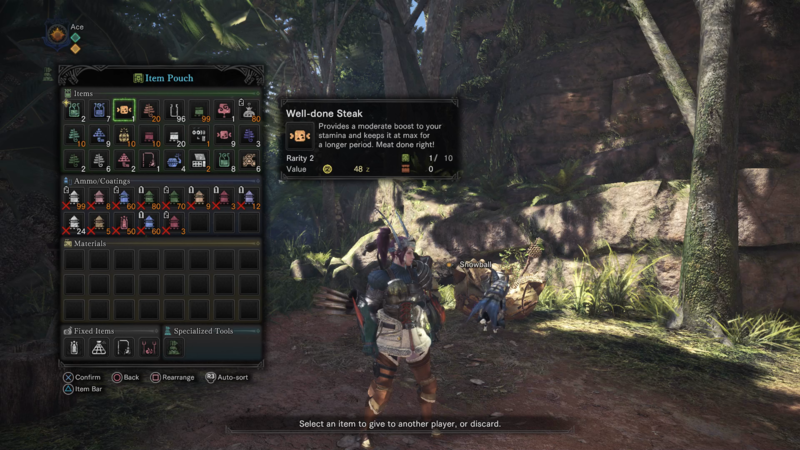 In your quick access menu in the bottom right area of your HUD, you’ll find the BBQ Spit item, which you can use to cook any Raw Meat items you have in your inventory, most commonly gained by slaying any monsters you find out in the wilds. Once you select the BBQ Spit with Square/X, your character will start cooking the Raw Meat item on the spit. This next part is all about timing, because you’ll have to stop cooking the meat by pressing Circle/B whenever you think the meat is cooked to perfection. Finish cooking the meat early and you’ll be left with Rare Steak, leave it too long and you’ll have some Burnt Meat on your hands. In order to obtain the perfect Well-Done Steak item (which provides you with a great Stamina boost), you’ll have to take the meat off the spit when it turns the perfect golden-brown color. 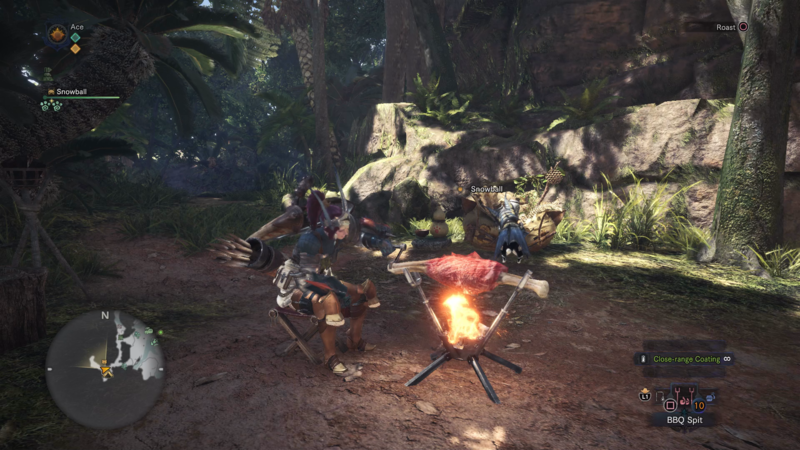 Practice makes perfect with cooking in Monster Hunter World, and before long you’ll be an expert at cooking the Raw Meat for the perfect amount of time. Keep in mind that you can take out the BBQ Spit and use it anywhere in the wild when you’re out adventuring, meaning you should always think of using it after a particularly tough fight. 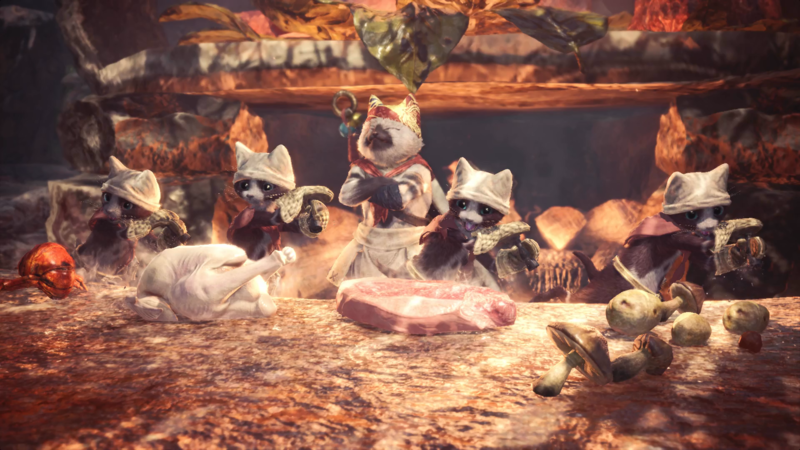 You can place a lot of orders with the Meowscular Chef and his companions, but which is the undisputed best meal in MHW? The answer isn't simple, as every meal provides various different benefits and bonusus, as you can see for yourself in the list below. However, we'd say that the Chef's Choice Platter is arguably the best meal to pick no matter the quest, as it'll always give you considerable health and stamina boost, as well as increasing your attack, defense, and elemental resistances from anywhere between a small and large amount. Although the bonuses are randomized, you're always guaranteed to gain bonuses for at least one of the aforementioned attributes, so the Chef's Choice is a must for when you're taking down Elder Dragons later in Monster Hunter World. Situated on the third floor of the main hub area in MHW, the Canteen is run by the Meow-scular Chef, and his chef comrades. 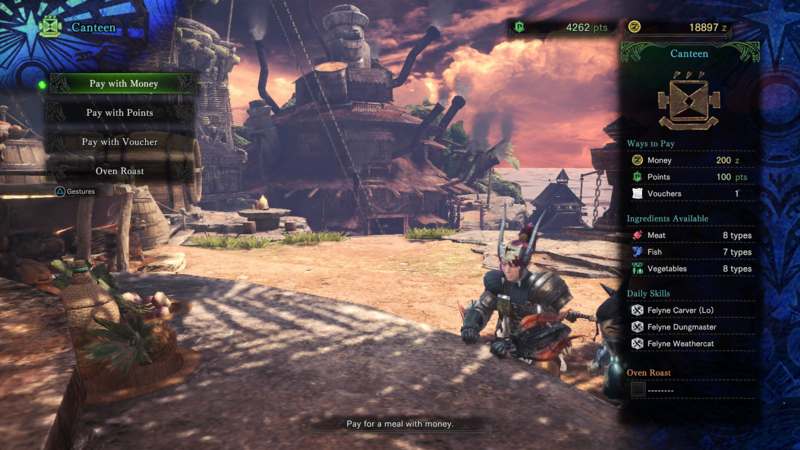 It’s as cute as it sounds, but you can also place orders for food here, which can give both you and your Palico certain stat bonuses for the next quest you undertake. However, you can only order the food dishes above from the Canteen if you’re carrying the corresponding food ingredient items. When you’re selecting a dish to eat from the Canteen, look to the right of you screen and you’ll see an ‘Ingredients Available’ tab, which will tell you how many types of Meat, Fish, and Vegetable ingredients you have at your disposal. Based on this, you’ll have to select which dish you can order, as long as you’ve got the ingredients to cover it. We’d recommend always heading to the Canteen before you undertake a mission, as the food you can find there offers some great statistic bonuses which we’ve detailed above. If you do forget to head to the Canteen before a mission, you can still revisit the Canteen by heading to a Campsite, and activating one of the stools situated near the tent, to bring up the menu available. While the Meow-scular Chef and his workers won’t be cooking for you here, you’ll instead have the Handler cooking for you, but you will still have the full menu at your disposal, minus the Oven Roast feature. The Oven Roast ability can be found back at the Canteen, just below the options menu where you choose how you’re going to pay for your meal. Within the Oven Roast menu, you can tell the Handler which ingredients you want her to Oven Roast, gaining a randomised reward as a result of the roasting. You can select basically any food-related item, such as mushrooms and meat, that you have in your inventory at the time, and you’ll be able to collect your rewards from the Oven Roast from the Canteen once you’ve returned from the next quest/expedition that you undertake. The Oven Roast feature is definitely more uncertain than outright ordering a meal, but we’d definitely recommend you try it out to get a taste for the rewards in store. This might conclude our Monster Hunter World cooking guide, but you can continue ahead to any of our additional guides on the game, including a complete list of every weapon in the game, as well as our Gathering Hub area guide. Here's where you can find the Grimalkyne Palico tribe within the Ancient Forest area of Monster Hunter World. Monster Hunter World Great Jagras - How to Track and Kill the Great Jagras in Monster Hunter World. This is our full list of all the Fortnite Jigsaw Puzzle Piece locations, spread out around the map. Here's our complete guide on accomplishing all the Fortnite Week 8 Challenges, as part of Season 8. This Forza Horizon 4 guide gives you all the tips you need to make a name for yourself. Here's our guide to all the Mortal Kombat 11 character revealed so far, as well as the Mortal Kombat 11 DLC fighters.